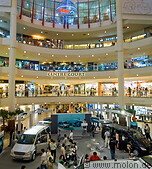 Mid Valley Megamall is a large, 420000 sqm complex consisting of a very large mall with three attached hotels (Boulevard, Cititel, The Gardens). It is located south of central KL, approx. 10 minutes by taxi. The complex was initially opened in November 1999. The Gardens hotel was added at a later stage. The hotel at MidValley are an excellent place to stay in KL, since you can immediately walk into the mall without having to cross streets, and are very close to KL.